After the Fourth of July, we made a fun little summer centerpiece to celebrate summer. 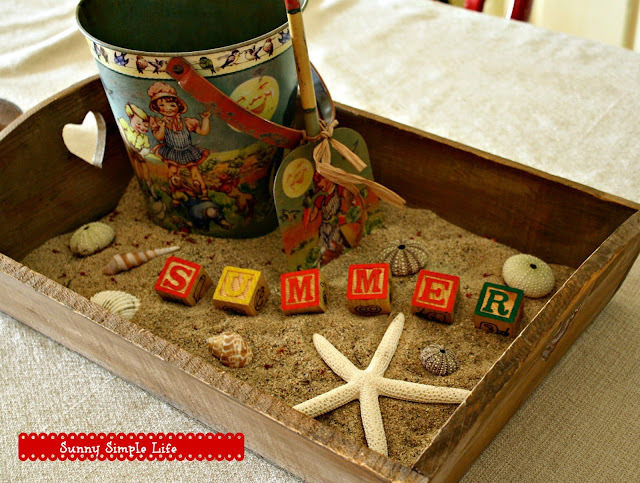 A vintage inspired sand pail, some sand and a few blocks said it all. It was summer. Time for the beach and fun in the sun. Little flowers in the sand were my youngest's contribution. She called them little crabs in the sand. A burlap banner in fun summer colors finished off the scene. It was a wonderful summer and though we officially have not turned the calendar to fall, it is pretty much over as school has started here. We may have warm weather but I am telling you bring on the PUMPKINS! I love that centerpiece! I have always liked those vintage sand pails, but they are so pricey. No, no, no - we haven't even gotten our sunny beach weather yet. I refuse to give up the idea that summer will arrive. But, I guess I had better start thinking about fall decor. Your little summer centerpiece is adorable. I loved sitting at your table, looking at the darling tray of sand and blocks and vintage pail....such a cozy spot!! Yes, summer is over, but the heat will carry on for a while yet. We are at the lake today. Going to a quilt show in a bit, then on the water. I was in Hobby Lobby picking up a bottle of paint and saw all the pumpkins and Xmas trees. It's too early for Xmas trees in my opinion. I find it kind of depressing to see the huge display. But I enjoyed the pumpkins, the bringing on of the next season. Such a perfect beachy centerpiece in the tray! Yes, Summer with beach weather is almost over ever where! Fall is beautiful too, it's my fav time of year because we have that beatiful weather around here too. Enjoy the rest of summer days. I am not ready for SUMMER TO BE OVER. WHAAAAA! Love that little pail in your vignette. The banner is the sweetest thing too. Holding on to the very end, as summer was so awful - hot and so much rain, I am enjoying this perfect weather and fighting the end of summer tooth and nail. 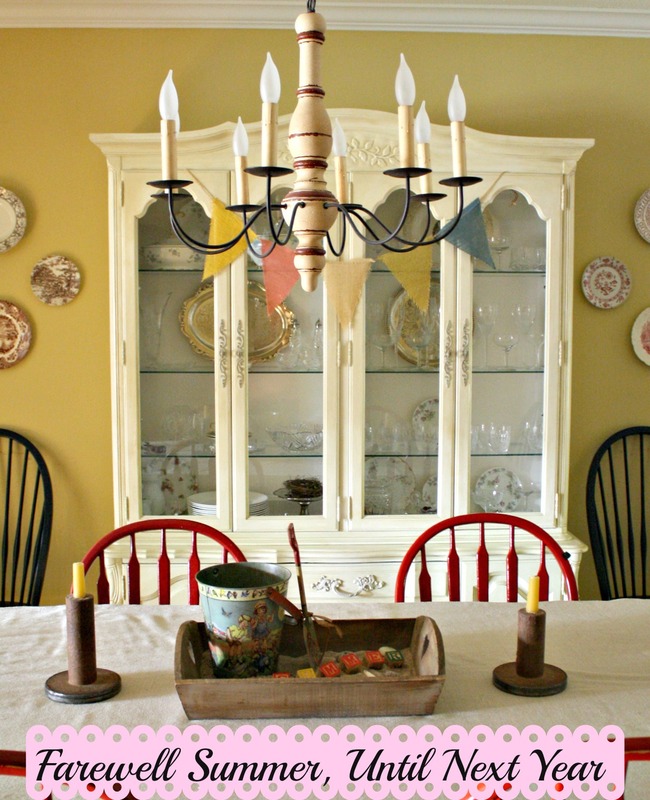 I love decorating for autumn best of all, but by golly I am NOT GONNA YET, haha. 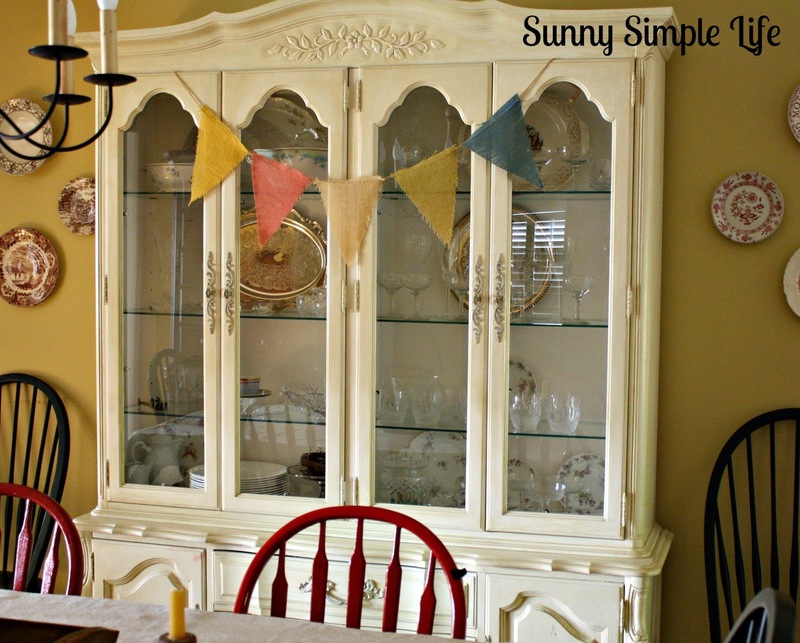 Love your summertime vignette, so clever. My garden is starting to take on a fall look. The pumpkins will be coming here soon too. Cute centerpiece! Ohhhhhh, I'm not QUITE ready to bid summer "adieu." No no no no no. Not yet. Still got a couple of weeks before school starts here. Pretty. Love that light fixture. Glad to hear you had a nice summer. It was unbearably hot here and not much fun. Here in Western PA our August has been cool. I do NOT like the heat and humidity ( which was all of July ) but now it is unseasonable cool. I am enjoying it but it has felt like fall for a week now and is a bit disconcerting as August is rarely like this. That little tablescape is just too adorable!!! What a lovely idea to commemmorate the summer, and a lovely way to wish a fond farewell. Happy Pink Saturday!